The Sunflower family is a very large family with over 25,000 members. Botanists subdivide the family into a number of tribes of which 14 are represented in Monterey County, one of these, the Heliantheae or Sunflower tribe, being further broken down into subtribes of which 9 are represented in Monterey County. 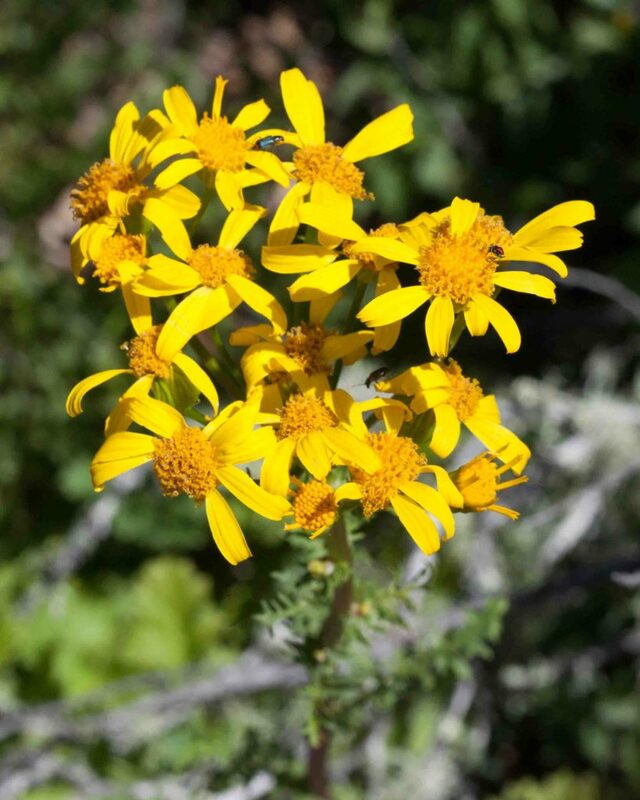 The Senecio tribe comprises a mixture of obviously daisy-like flowers and others which might not immediately be recognized as belonging to the Sunflower family. 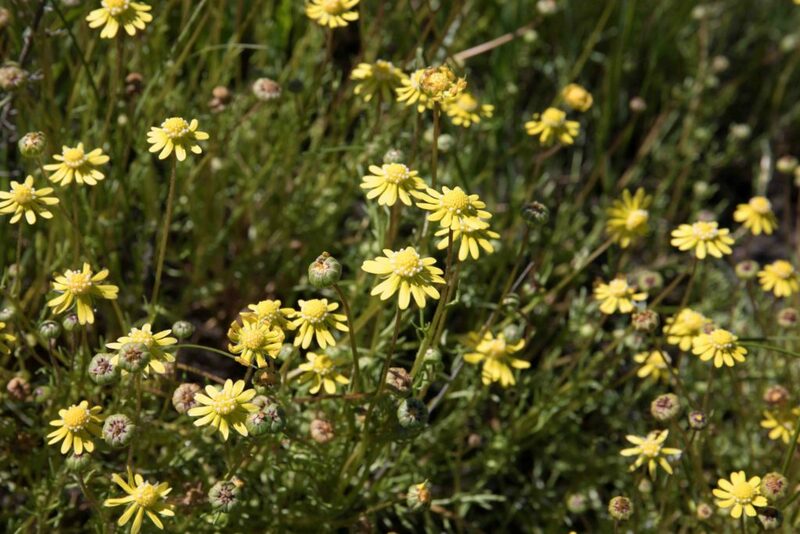 This page includes the non-Senecio genera which include some very attractive natives and one of the worst non-native invasive species. 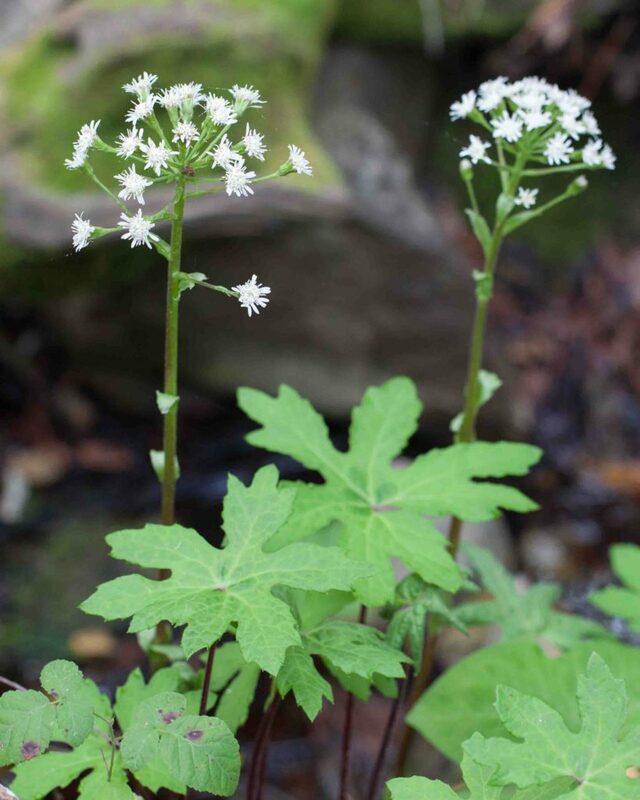 A small plant, annual, with a single erect but branched stem. 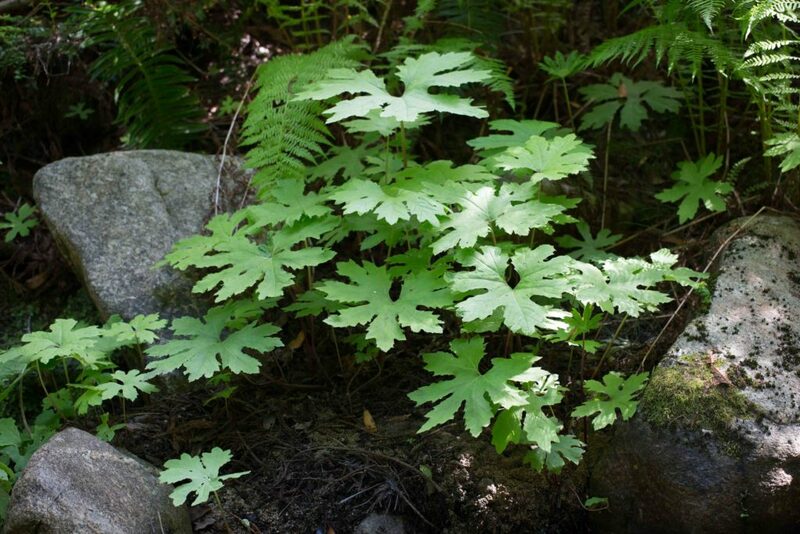 The leaves are alternate, mostly sessile; the blades pinnately divided into 2–15 linear lobes. 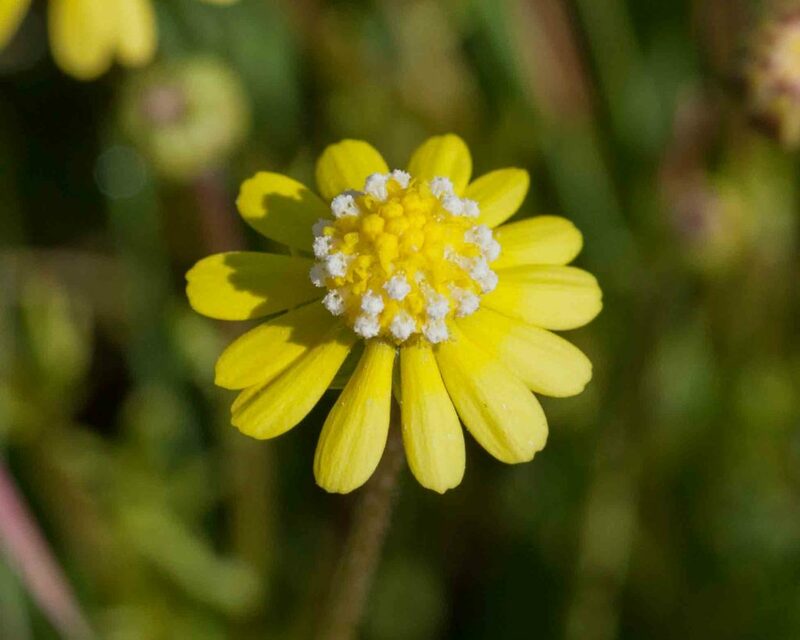 There are 5–13 yellow (occasionally white) ray flowers with a yellow stigma and 20–60 disk flowers with white anthers. Uncommon, most easily seen just inside the Jolon entrance to Fort Hunter Liggett. 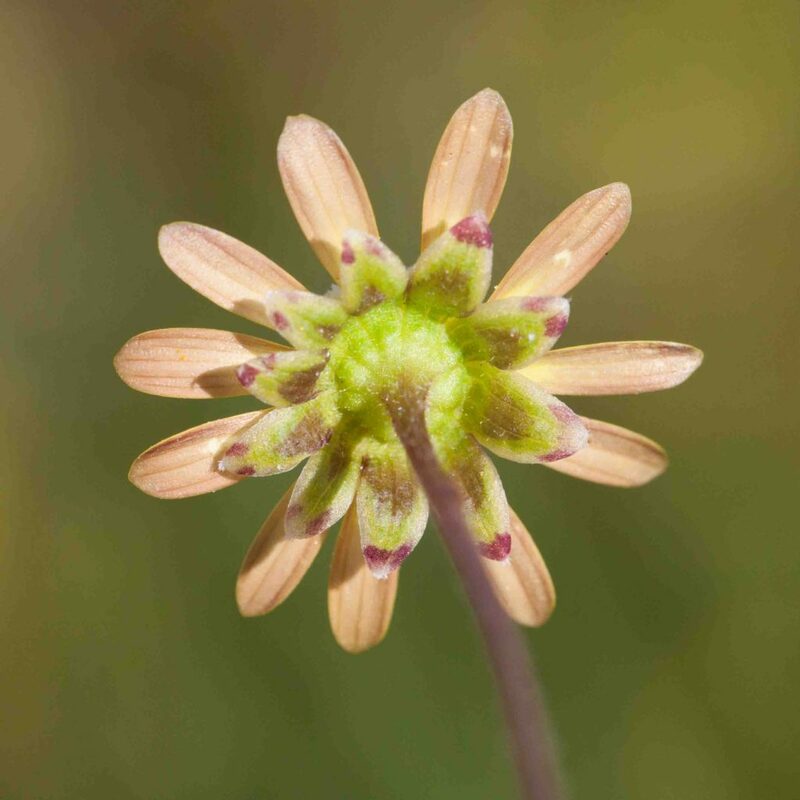 Multiple flower heads with strap-shaped ray flowers are in clusters at the tip of a single stem. 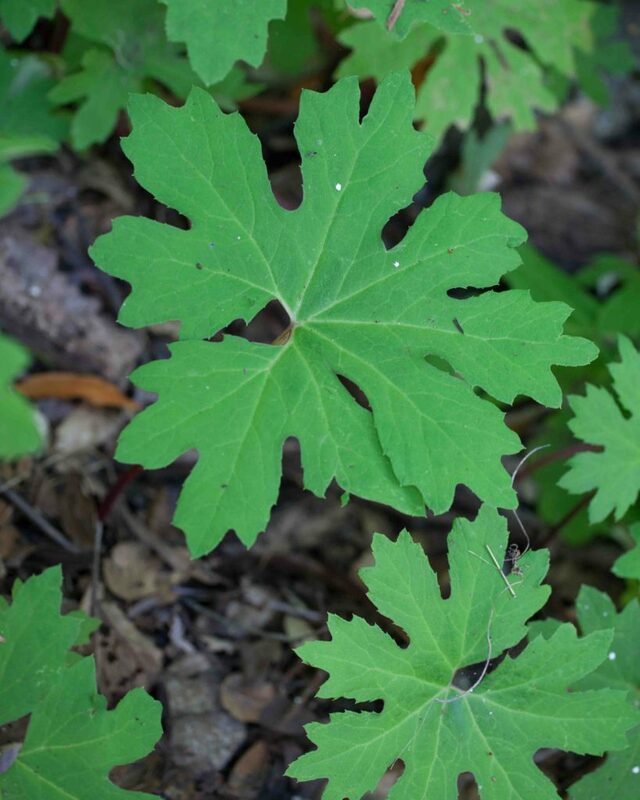 The leaves are pinnate, the basal leaves being larger and more deeply dissected than those on the stem. 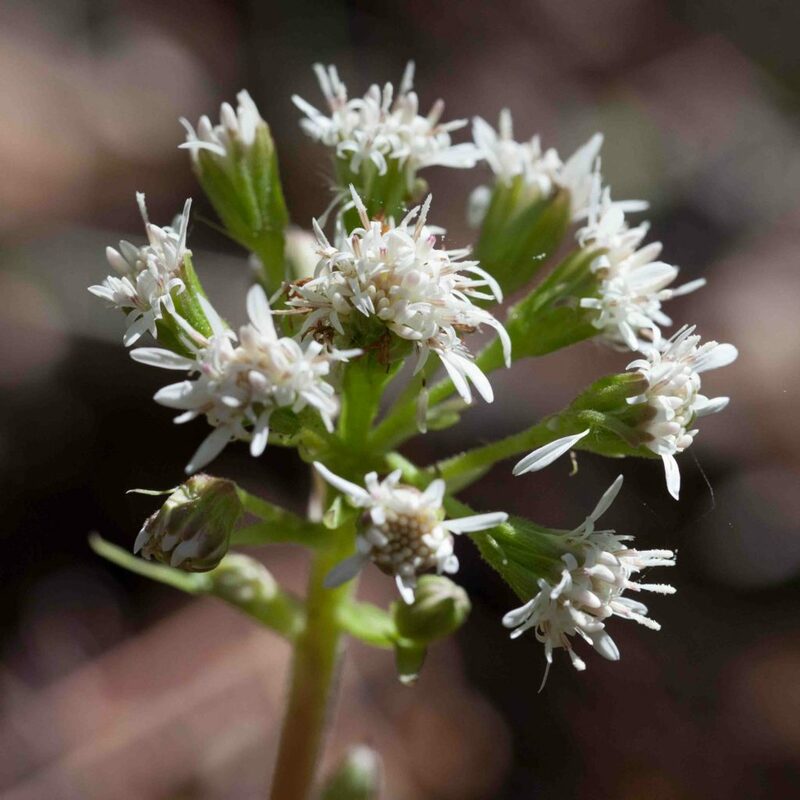 There is a single peduncle with a terminal cluster of small white inflorescences which comprise mostly disk flowers although a few ray flowers may be present. 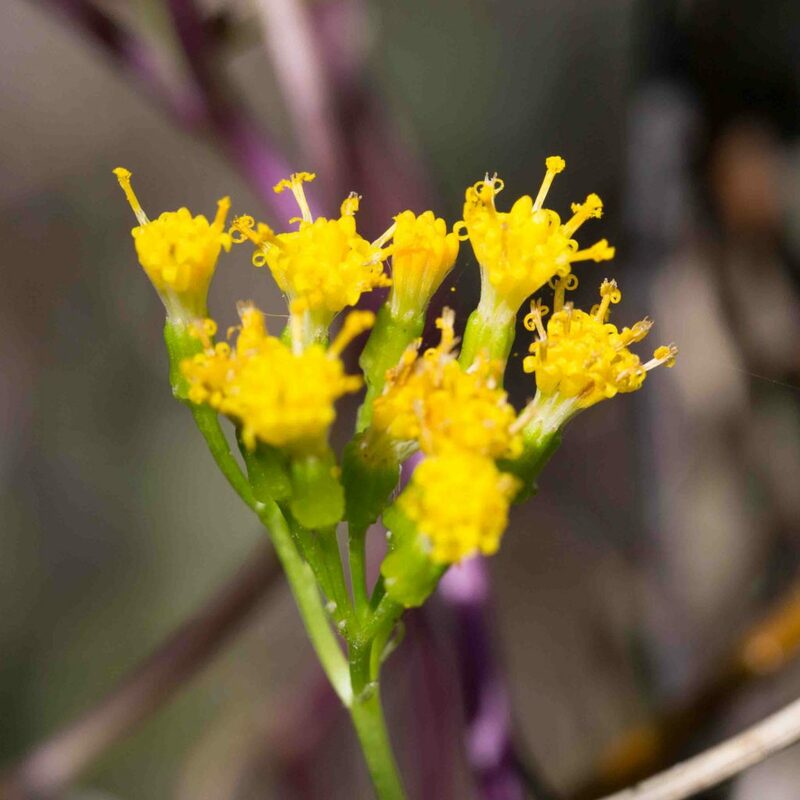 The plant is more or less dioecious, the disk flowers being predominantly staminate (male). 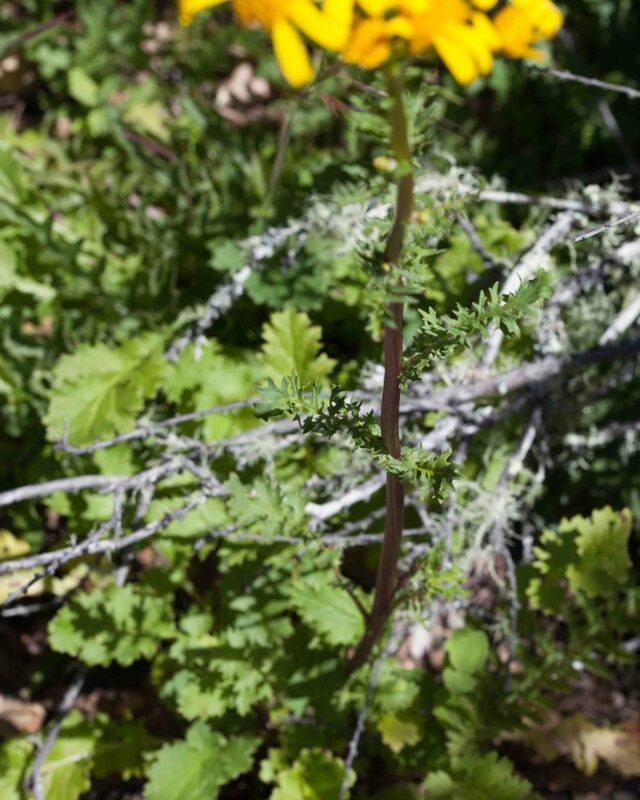 The peduncle and flowers appear in early spring before the large and immediately recognizable palmate leaves. Like true ivy, this is a vine that climbs over trees and shrubs. Leaves are ivy-like and palmately lobed. Inflorescences comprise disk flowers only. 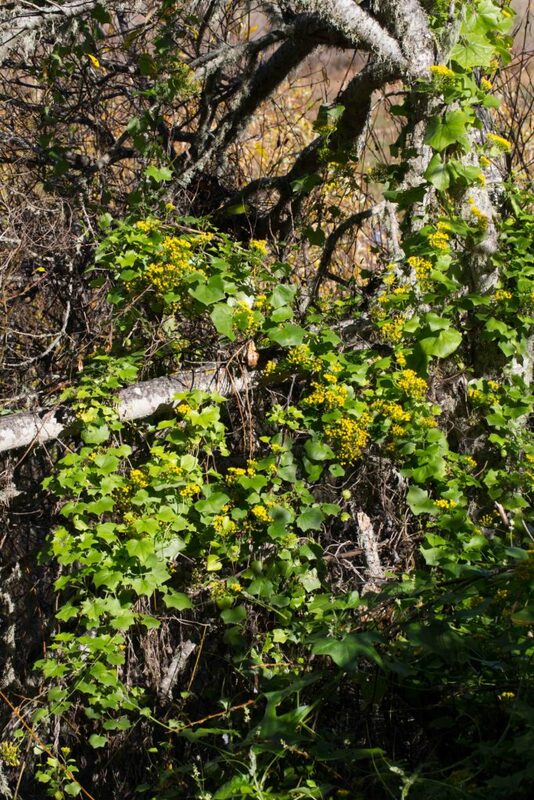 Highly invasive and difficult to eradicate, extremely common in Big Sur and many other parts of Coastal California. 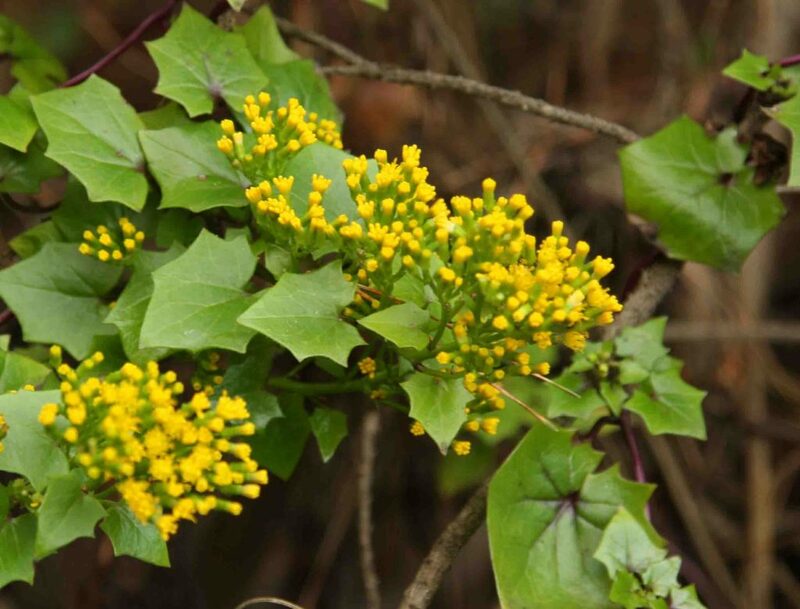 Sometime called German Ivy although Cape Ivy is a more appropriate name given its South African origin.